According to Wikipedia, HOTAS is an acronym of Hands On Throttle-And-Stick, is the name given to the concept of placing buttons and switches on the throttle lever and flight control stick in an aircraft's cockpit, allowing pilots to access vital cockpit functions and fly the aircraft without having to remove their hands from the controls. 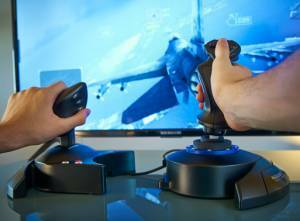 For gaming, this is a full-sized, realistic joystick (that comes with a separate throttle unit) based on real aircraft controls for close-to-the-real-thing experience. The second one is from HORI. They’re a well-known 3rd-party manufacturer of controllers and gaming accessories at a reasonable price. Unlike the Thrustmaster which has separate hardware for the PS4 and Xbox One, HORI’s flight stick is compatible to both platforms. Comments for What flight stick can I use?